I was tasked with preparing the appetizer portion of a dinner over the weekend and this is what I came up with. These fresh Gulf shrimp (1.5 pounds if you're keeping score) were a real find, as they hadn't been frozen. That's an unusual siting around these parts and so My Associate and I pounced on the crustaceans — pronto! The appetizer I was concocting required shelling the shrimp and so I decided to make a stock. This step is optional, as you'll only need a couple ladles full of broth in the recipe. Any chicken or vegetable stock you've got around should be fine. In a pan that can later be used in the oven (I went with cast iron) saute a few garlic cloves and some hot pepper in olive oil. Once the garlic is softened but not browned add one can of hominy (drained) and a ladle or two of stock. Then add the shrimp and place the pan in an oven preheated to 400 degrees F.
When the shrimp are cooked (these took around 10 minutes) add 1/4 pound of diced prosciutto, mix thoroughly, then quickly transfer to a serving plate so that the shrimp don't overcook. Allow to cool to room temperature before serving — with some nice crusty bread, of course. One night when I was a boy I sat at the kitchen window of our apartment in East New York, Brooklyn, and watched a gigantic red-brick warehouse filled with toys and bicycles and other fun stuff go up in flames. In between the fire and our home were several buildings — mostly other houses but also a Catholic elementary school and a convent where the nuns lived — and so it was unlikely that the fire could spread all the way to where I was sitting. I'm not sure I understood this that night, though. The whole thing was so awful and terrifying. Even today I can remember the flames and the smoke. Sometimes, when the smell of the burning toys seeps into my memory, as it will do, I get a little queasy. More than 40 years later. It was only recently that I became conscious of an important role the fire has played in my life: It turned me into a fig tree nut. At least I think it did. See, the neighborhood where I grew up was just lousy with fig trees. They grew in people's backyards, front yards, side alleys, even surrounded by concrete and tucked into spaces where they probably didn't belong. As a boy I was completely taken by these trees. They were strong and potent living things that held their ground under all conditions. They were survivors, warriors even. Oh, and the fruit they pushed out was pretty awesome. While the toy warehouse fire burned I became obsessed with the fig trees that might be in its path. The one closest to me, just outside our kitchen window and in the Casillos' backyard, was probably safe, I calculated. But what about all the others? I can remember counting all the trees that I knew about, or had enjoyed figs from, within a couple of square blocks of the fire. There were a lot of them. And I fretted for them all. I don't know why it's taken me so long to make the connection, but I'm now convinced that that fire is the reason I keep so many fig trees, many of which are projects that need nursing back to health. I don't live in Brooklyn anymore, where fig trees can grow in the ground. I live in Maine, where they must be kept in pots and moved indoors in winter, lest they die. The four trees pictured above aren't all of my fig trees. A couple more are at cousins John and Susie's place, waiting for me to pick them up now that the weather has turned warm. Others I've recently been told about are likely to wind up with me as well. And then there's this guy. 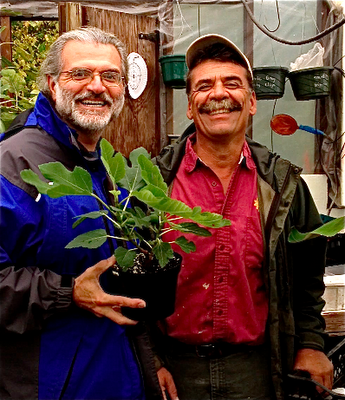 My friend Peter Risbara is the capo di tutti capi of nurturing fig trees to life. The guy kicks out fig trees like nobody I've ever known. His greenhouses have always got a ton of cuttings in the works, and, well, they're always looking for somebody to take them home and watch over them. When my trees get sick I bring them to Pete and they get well. Like me, he needs to take care of them. One day I'll have to ask him if he ever watched a warehouse go up in flames when he was a boy.